If you arrive in the morning or at least noon in Surabaya, and last day need to fly early, this tour is perfect for you. Arrival in Surabaya in the morning then long drive to Ijen Area. (about 7 hours drive) . Check in hotel. Recommended to depart in the morning or at least noon. Pick up at 01.00 and driving about 1 hour to Paltuding. From Paltuding then trek about 3.5 km or 1 hour to Ijen Crater and watch Ijen Blue Fire . 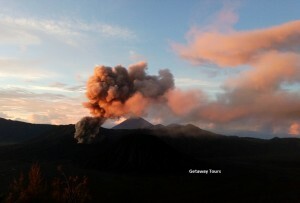 Afterwards expecting sunrise and enjoy Ijen Crater and take photograph. About 06.00 descend to Paltuding and drive back to hotel and check out. Drive (about 4 hours) to Bromo Area. Check in.